The original Traveller role-playing game had a characteristic “style” or “mood”, emphasizing traveling, “geography” and trading like few other games. My old game group spent many happy hours going from planet to planet in its far-future cosmos. It was a best-seller in 1980 and it is still around today in its fifth reincarnation. Traveller has also served as an inspiration for other role-playing games. 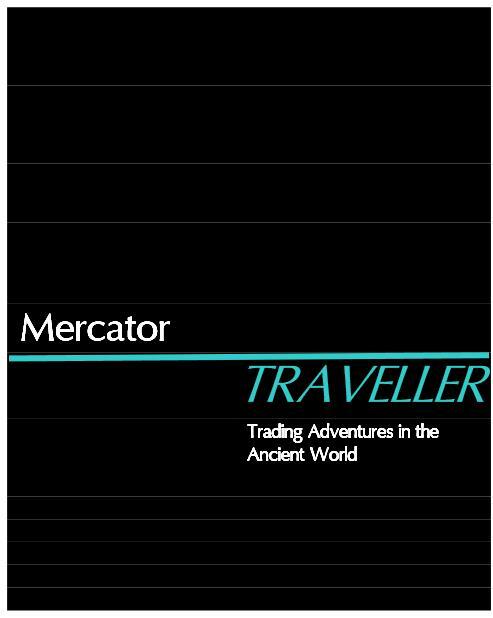 Here is a 60-page PDF with Mercator (link >>>), an amusing pastiche of Traveller. It takes place in the Eastern Mediterranean in the early 1st century AD. Its rules, campaign background and minimalist layout are accurate reminiscences of GDW‘s Traveller booklets with black covers that were published in 1977. The players ply the waves instead of the star lanes and have to deal with the intricacies of the Roman Empire instead of the Third Imperium. The many Hellenistic realms of the East have recently come under Roman rule and a lot of inhabitants resent that. The adventurers thus have to make their hazardous living in a restless multi-ethnic region. The potential for high adventure is certainly there. This entry was posted in English, Role-playing Games and tagged Marc Miller, Traveller by Gondica. Bookmark the permalink. It would be easy to use these rules and use the Baltic Sea instead of the Mediterranean. Interesting eras could be the Viking Age or when the Hanseatic League dominated the trade of the Baltic Sea. Maybe this version of the game could be called Störtebeker? I think that the early Hanseatic period would work better, because it contains a wider variety of “tech levels”, from proper merchant cities in the southwest to forest barbarians in the northeast. Not to forget the Teutonic Knights — perhaps the equivalent of the Aslan. And the Catholic church as an tentacular “megacoporation” with great intel and knowledge power.